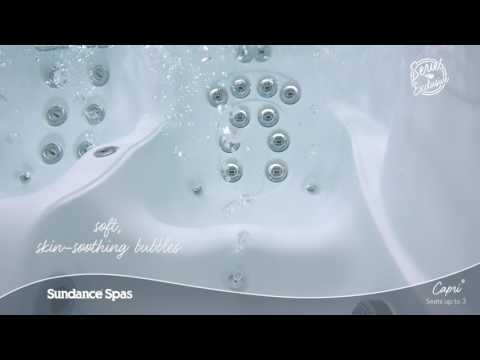 Some people search the web for the “best hot tub” and others key in “best spa,” but no matter how you spell it, Sundance is what you’re seeking. There’s a Sundance® model for every backyard, from a tight corner to a big deck with a view. The Capri hot tub may be your ideal, with its side-by-side seating and armrests, plus Pulsator wrist jets. Calling to mind the carefree isle of Capri, this spa raises the category of hottubs-for-two to a new level with an illuminated waterfall, underwater lighting and an easy-to-reach digital control panel. Since no man is an island (and even couples like company) there is room for three in the Capri – entice the grandkids over to visit using the “hottub” invitation.